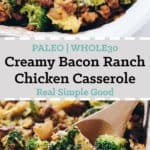 Creamy bacon ranch chicken casserole. That is all you need to know this fall and winter. 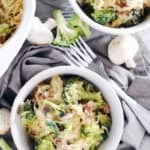 I promise this will get you through the cold months and help you get over any hesitation you have about cooking with spaghetti squash! Ok, who is intimidated by the thought of having to cut the spaghetti squash in half?!?! Me, me, me! The first time I bought a spaghetti squash I lived by myself and was so excited to cook with it, but then got home and realized I had to do the cutting. Ugh…after almost slicing a finger off, I got it cut but basically vowed to never do that again. I thought that was the first and last time I’d cook with spaghetti squash, but then I ate the meal I prepared and loved it and wanted to eat it all the time. Total dilemma. So, the next time I went to the grocery store I politely asked a guy working in the produce section if he would kindly do the cutting for me and he was like yeah, no problem. So….until I started dating Justin, that was my go-to for spaghetti squash and is still my best tip for getting it cut in half. Luckily now, Justin takes responsibility for safely cutting our spaghetti squash in half. Phew! But if you’re like me and totally intimidated, just ask someone working in the produce section to cut it for you! Problem solved and now you can enjoy all the spaghetti squash you want! You’re welcome! 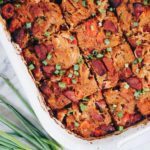 This bacon ranch chicken casserole is dairy-free and creamy from the homemade ranch used in it. Do you make your own ranch dip or dressing? We love making our own because it’s super easy and also because it’s WAY more creamy and delicious than the store-bought kind. And..there are no crap ingredients, just quality Paleo-friendly mayo and some dried seasonings. 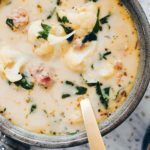 Then you mix it up with the rest of the ingredients in this casserole, and the result is a lot of ranchy, creamy goodness! You won’t even miss the dairy, we promise! 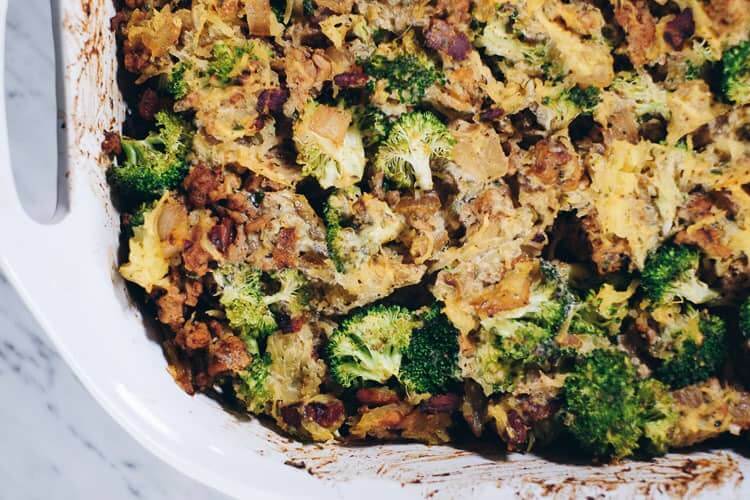 We chose to add some broccoli into this dish to sneak some extra greenery in. Gotta get those servings in! You could even add some kale or other greens. You could also sub another veggie in place of the broccoli. Some options would be asparagus, canned artichokes (note to self to try that next time we make this), green beans, baby bok choy, etc. You can definitely get creative and adjust to your preferences. Let us know how it goes if you do! 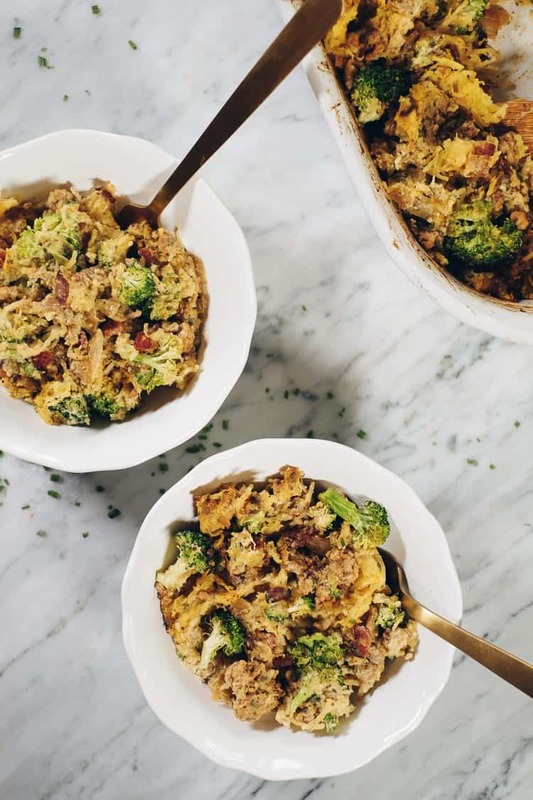 Add this creamy bacon ranch chicken casserole to your fall/winter game plan! 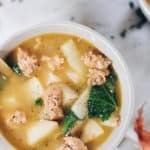 It’s a great way to use seasonal ingredients and enjoy all the coziness this season has to offer! Let us know how it goes by leaving a comment below. Also, take a photo and tag us on Instagram @realsimplegood, so we can check it out! 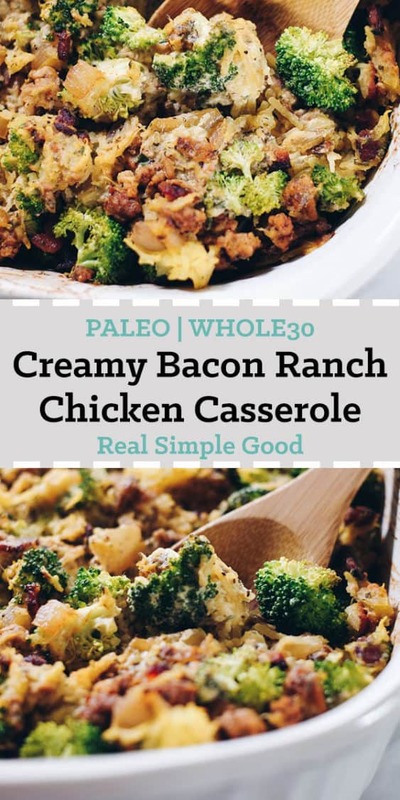 This Paleo and Whole30 Creamy Bacon Ranch Chicken Casserole is all you need to know this fall and winter. 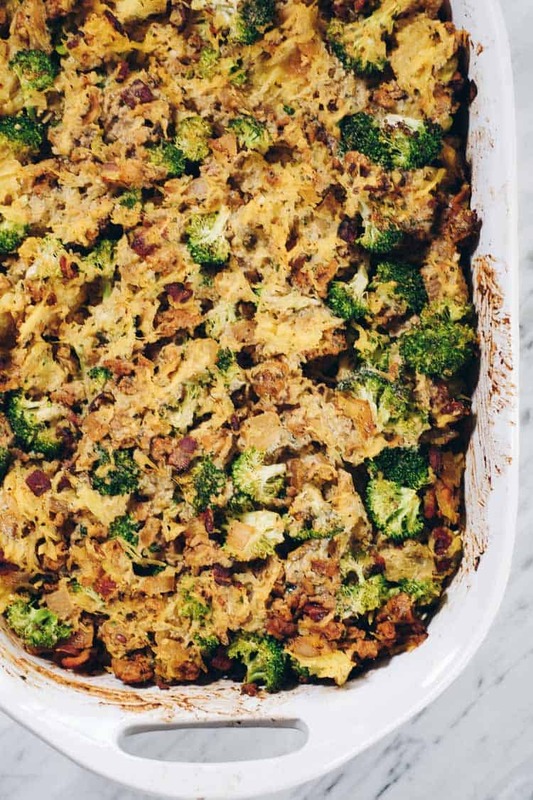 It's a healthier, creamy and dairy-free casserole! Preheat oven to 425° Fahrenheit. Slice the spaghetti squash lengthwise and scoop out the seeds. Place the two halves face-down on a baking sheet and place in the oven to bake for 30 minutes. While the squash is cooking, make the ranch dressing by combining all dressing ingredients in a small bowl or container and whisking well. Add more water if needed if the dressing is too thick. Place in refrigerator while you prep the other ingredients. Dice bacon and heat a large skillet over medium heat. Once hot add in bacon to cook, stirring occasionally, until it is just getting crispy, about 7-8 minutes. Remove and place on a paper towel lined plate. While bacon is cooking, chop onion and broccoli. When the bacon is finished, retain bacon fat in the pan and leave it on medium heat. Add in chicken and onion to cook. Break the chicken meat into small bits and cook, stirring occasionally, until the chicken is cooked through, about 7-8 minutes. When the chicken is almost cooked through, add in garlic powder, chili powder, salt and pepper. Stir to mix and remove from heat once cooked. Remove squash from oven after 30 minutes and set aside to cool. 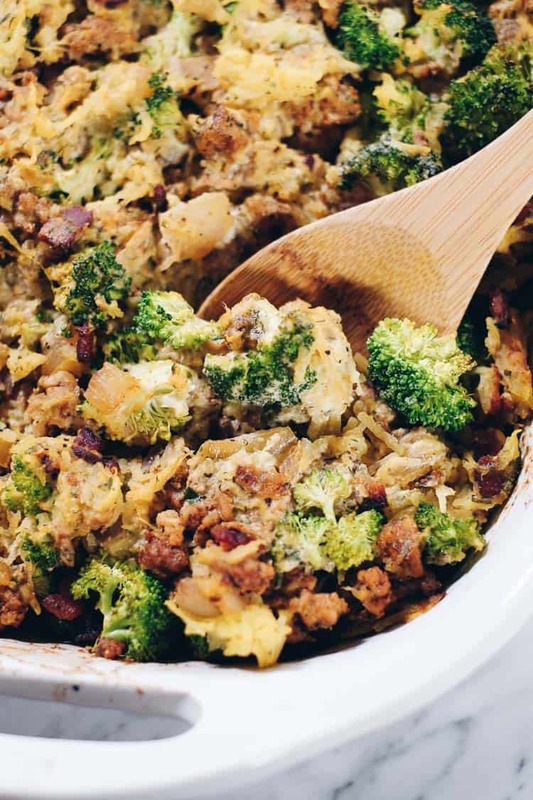 Keep the oven on at 425 degrees and grease a 9x13 casserole dish with butter or ghee. Once the squash has cooled enough to handle, you are ready to put it all together. 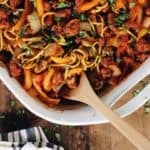 With a fork, scrape out the spaghetti squash "noodles" into the casserole dish. Add in the cooked chicken, bacon, broccoli, and ranch dressing. Mix everything together well. Place the casserole in the oven to bake for 15 more minutes. Remove and serve. If desired, you can sub 1 cup of Primal Kitchen Ranch Dressing for the homemade ranch dressing. I will definitely try your recipe this week. I, myself, don’t like cutting into a hard squash. Cook Eat Paleo has a tried and true recipe for roasting a whole squash or pumpkin in the oven. I’ve also put a whole squash in the crockpot with no water. Both work beautifully. No knife skills involved. I cook my spaghetti squash in a crock pot! Never cut one in half again. Just like a few times with a knife and cook it on low or high until soft. Then it is easy to cut open and scoop out. This is my go to for spaghetti squash now. Just poke a few times with a knife. Lame autocorrect. That is a great idea! 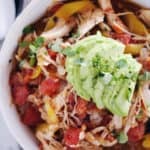 How long do you typically cook it in the crockpot for?? Hmm maybe 2-3 hours on high or 4-5 on low. I usually put mine on low in the late morning and just go about my day. Cool! We’ll have to try that. 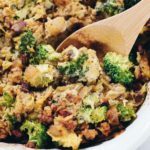 We usually do the cutting and baking since it takes less time, but using the crockpot is good for days when we are busy! Thanks! This was great! It is a bit time intensive, I definitely suggest doing some of the prep work a different day if you can. I cooked my squash (whole, in the instant pot) and cooked up the meat (I used half ground turkey, half chicken chorizo) on a night we were eating leftovers. That made tonight much easier. I also used my homemade cilantro jalapeno ranch. And I added chopped spinach. But this is a meal that I can play with/tweak based on what I have on hand and I get the feeling it’ll be great every time. The kids got cheese on their half, and I’ll admit to being jealous, but it was still good without it. Thanks for a great meal that my whole family loved!